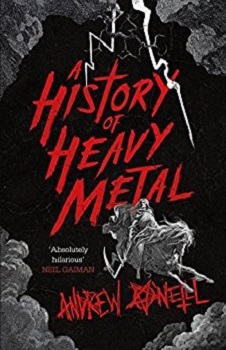 A history of heavy metal brings brings us extraordinary stories of larger-than-life characters living to excess, from the household names of Ozzy Osbourne, Lemmy, Bruce Dickinson and Metallica (SIT DOWN, LARS! ), to the brutal notoriety of the underground Norwegian black metal scene and the New Wave Of British Heavy Metal. It is the story of a worldwide network of rabid fans escaping everyday mundanity through music, of cut-throat corporate arseholes ripping off those fans and the bands they worship to line their pockets. The expansive pantheon of heavy metal musicians includes junkies, Satanists and murderers, born-again Christians and teetotallers, stadium-touring billionaires and toilet-circuit journeymen. I’ve always been a huge heavy metal fan, even going as far back as I can remember, a very young child, so I was eager to read this book as it seemed right up my street. I started the book not long after finishing Bruce Dickinson’s autobiography, but the two books couldn’t be more different. The book covers lots of subject areas within heavy metal as well as other extreme metal music – These did seem to dominate over your norm, well known heavy metal. There were even a few groups mentioned that I’d never heard of before. However, Andrew O’Neill’s voice comes across strong and makes these areas as interesting as all the others. If you are a big metal fan this book will be of interest to you. It can be heavy going at times and a few sections I found myself flicking through rather than reading, but overall it was informative and I certainly learned a lot. I also have to agree with the author that the 1990s saw the demise of heavy metal and although some groups are still going (or making a come back) there doesn’t seem to be that much interest amongst the youngsters nor the radio stations these days. If you have no interest or only a passing interest in heavy metal I can’t see this book catching your attention for long and so I would pass it by. This is for major fans only. Andrew O’Neill is an award-winning comedian and heavy metal guitarist. His comedy show Andrew O’Neill’s History Of Heavy Metal has received universally glowing reviews in the heavy metal press, as well as rave comedy reviews. He has appeared on television in Saxondale, Never Mind The Buzzcocks, and 50 Years Of Rock Excess and his own award-winning BBC Radio 4 stand-up show Pharmacist Baffler. He has written for The New Statesman, Terrorizer and Time Out. His neck is so thick from headbanging that standard shirt sizes do not fit him. I like softer metal music so I don’t think this would be for me. I can understand why you say for super fans only. Sounds interesting – I like ‘medium metal’ and hard rock (Aerosmith, AC/DC, Zep) rather than heavy/thrash – but this sounds like a great book for total metalheads!!! Cheers to Steve! I like the idea of the history of it – wouldn’t mind reading it, actually, wish he would submit it to Rosie’s blog!! It came direct from the publishers not from the author. It was good but really only for heavy metal fans.